I work with Chee Yi at Expedia- we write Swift code for 8 hours every day and often discuss other topics and hobbies we have. We both have a love of photography. He had been planning on getting married to his long-time girlfriend Zen-Zi, and they decided to elope at the local county courthouse. He bought a Canon EOS 5D Mark III, but he can’t photograph his own wedding. So he asked me to do it. How could I turn him down? I’ve been taking photos and portraits of family and friends, and also doing some street photography for years. So now I can say I am a wedding photographer! Before the ceremony, I took a few photographs of the couple and the bouquet. The ceremony was short and sweet. The judge read the vows, and the bride and groom’s parents watched the ceremony on a FaceTime call. After the ceremony, I took some shots of the newly married couple in the Government Center. Now that the ceremony was over, we walked through the Minneapolis skyway and stopped for some portraits along the way to the restaurant for dinner. After braving the cold for only one block, we made it to the restaurant for dinner. Everyone but me ordered seafood. Zen-Zi’s sister Wen-Qi baked a very fancy wedding cake, and after dinner the wedding couple fed each other some of it! It was a great day, and I wish all the best to the happy couple. It was an honor to photograph the event for them! 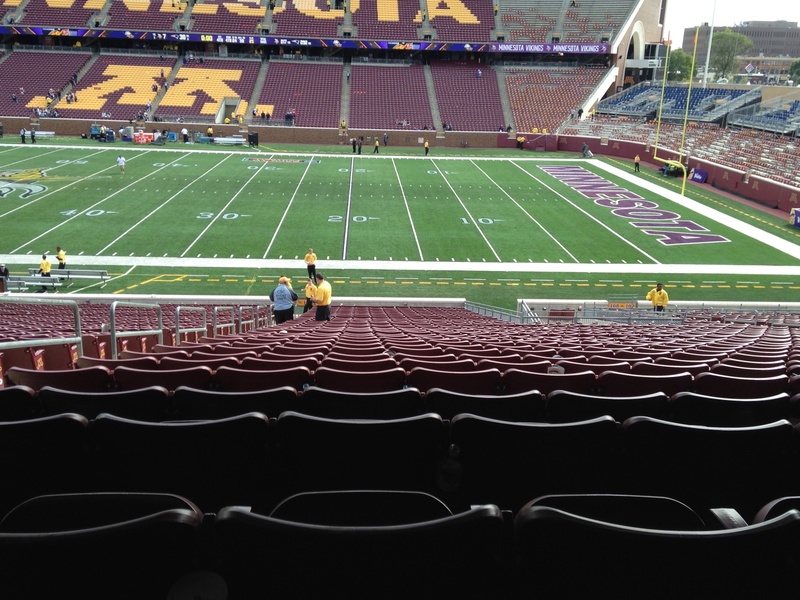 I had seats in the first row at the recent NFL football game between the Minnesota Vikings and the New England Patriots. I brought my camera and took as many shots as I could of the action since I was so close. I did my best impression of a sideline photographer. The game was at noon, so we left at 10am, thinking that would be plenty of time to get there. We were wrong. 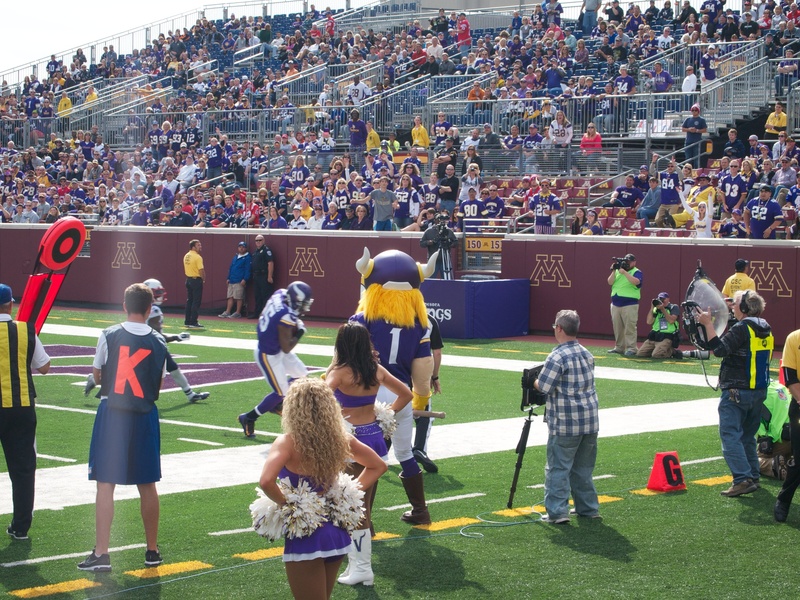 The Vikings are currently playing at TCF Bank Stadium, home of the University of MN Golden Gophers while the new Vikings stadium is under construction. Traffic was very heavy getting to the game. We had pre-paid parking at a lot near the stadium. 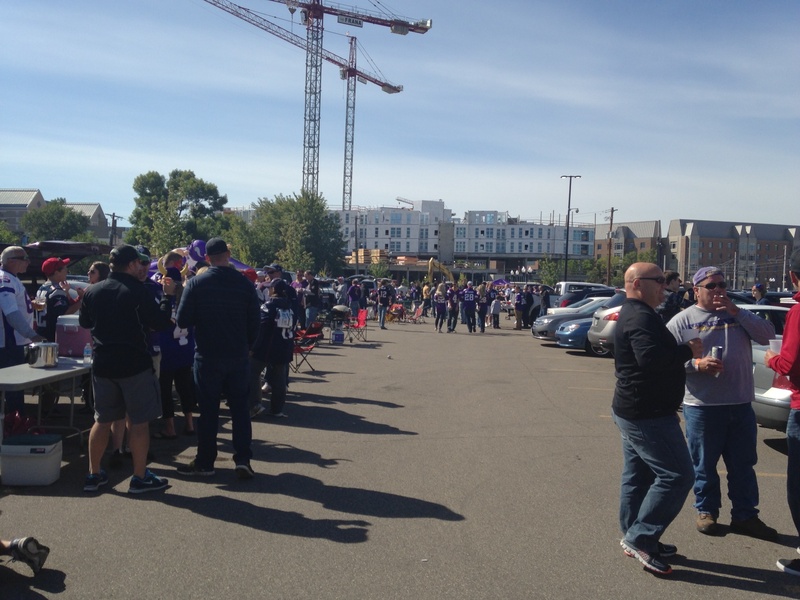 When we got there, we realized we were parking in a tailgate lot, and had to slowly, carefully, and awkwardly drive past football fans in the lot who were happily drinking beer, grilling, and playing catch. Then we just parked in a space where previously people were playing catch after they moved their beer. Embarrassed, we hurried out of there to get into the stadium. 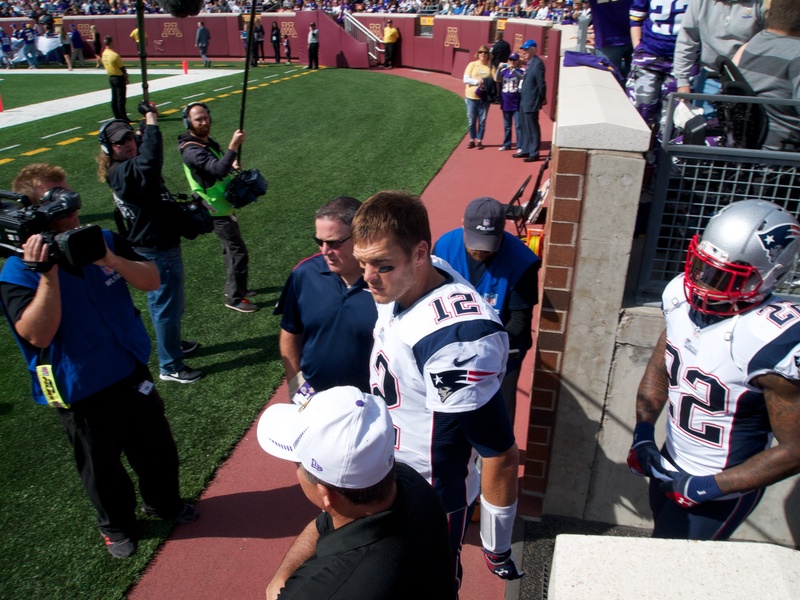 Our seats were right by the tunnel where the visiting team enters the field, which we were not aware of, but it was a very good surprise to see the Patriot players up close. The view from our seats was great. 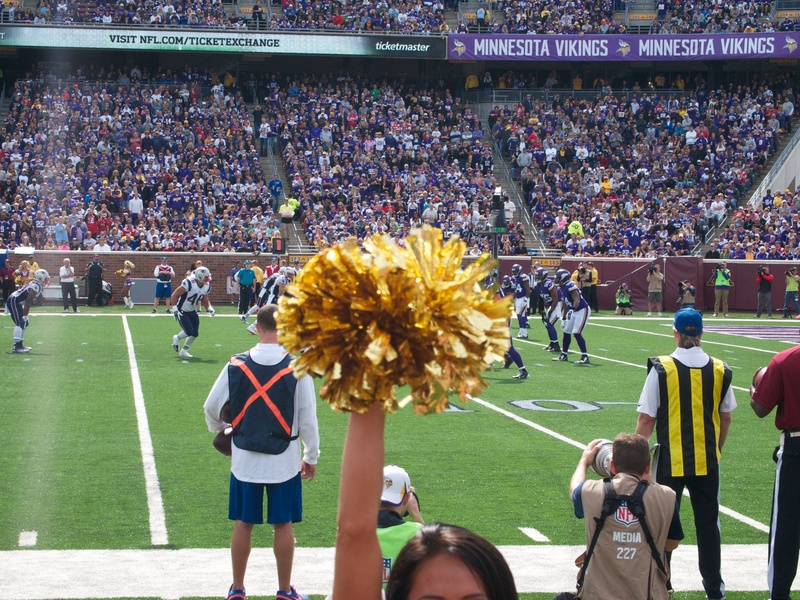 We were so close that the cheer leaders could obstruct our view of the game with their pom poms! Thankfully I only have one shot where this happened. I did get a shot of Greg Jennings making a catch in the front corner of the end zone, but he only got one foot in bounds. I didn’t see that particular foot myself because a cheerleader obstructed my view. Another thing I experienced (that I did not expect) is that a lot of fans ask for mementos from the players as they exit the field. Lots of shouts for gloves, head bands, etc. from the players on their way out. 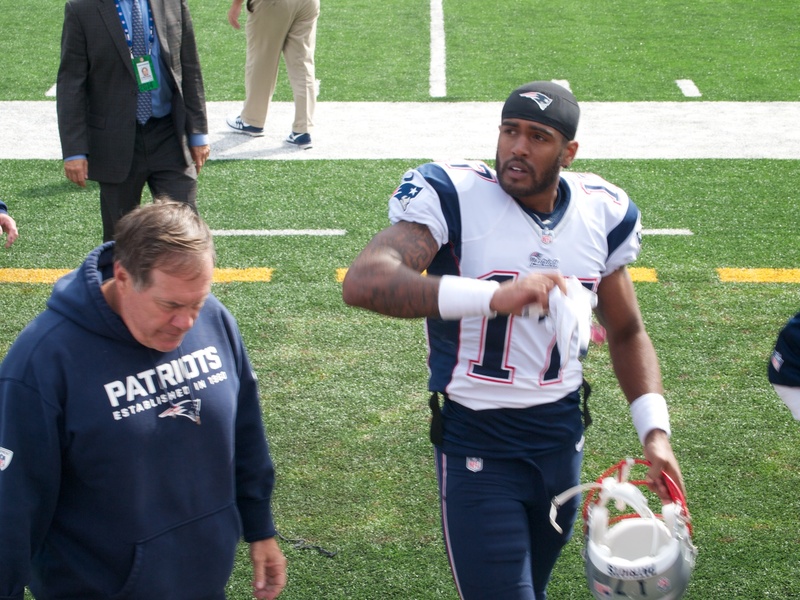 Here’s a photo of Aaron Dobson throwing his gloves into the stands. I couldn’t bring myself to take part in the mayhem since I was wearing a Vikings shirt and asking Patriots for mementos just seemed wrong. Unfortunately, the Vikings lost the game, but it was a great experience. All of my photos can be seen on my Flickr account here. You may think that you do not want the midday sun behind your photography subjects. With the sun behind them, they would be in shadow. But then if you put the sun behind you and have your subjects face the sun, this photo is what you get. It was impossible for anyone to keep their eyes open! If the sun is extremely bright and overpowering, your best bet is to put the sun to the side of you and your subjects, or take the photos at a different time of day if possible. Debtor version 1.5 is now available in the App Store. The keyboard functionality has changed in this version to use the full keyboard instead of the number pad keyboard. This way, I was able to eliminate the need for an accessory bar above the keyboard with Navigation and a Done button. This frees up more space for content, which is needed on the iPhone 4S. The standard keyboard already has a Next/Done button. Plus, tapping anywhere in the background on the Calculation screen (the first screen in the app) will dismiss the keyboard! Support has also been added for the new iPhone 6 and iPhone 6 Plus, and for iOS 8 as well. Feedback and reviews in the App Store are appreciated! Author barryjbroPosted on October 8, 2014 Categories programmingTags App Store, Debtor, iphoneLeave a comment on Debtor version 1.5 with support for iOS 8 and the new iPhone 6 and 6 Plus is now available! Debtor version 1.2.1 is now available! This update to Debtor for iPhone® or iPod Touch® includes some interface tweaks for the comparison feature introduced in version 1.2, along with bug fixes and an update to the Comparison and Results screens so that they have the same background as the main screen. Download it now! Author barryjbroPosted on August 12, 2012 August 12, 2012 Categories programmingTags Debtor, iphoneLeave a comment on Debtor version 1.2.1 is now available! Debtor version 1.2 now available! Debtor version 1.2 has been approved for sale in the iTunes App Store. This version adds a compare feature. Compare the current monthly payment to any number of other payment scenarios, or compare the current number of months to any number of months. Debtor will show how much money can be saved by paying more per month, or paying off a debt in fewer months. Conversely, it will also show how much extra money will be owed by paying less per month, or paying off a debt in more months. Numerous bug fixes are also included in this update. Author barryjbroPosted on June 27, 2012 Categories programmingTags ios, iphoneLeave a comment on Debtor version 1.2 now available!